Terrance Maloney built his first Shoji while working as a cabinet makers helper in 1982 when he apprenticed with John Massiocchi in Portland, Oregon. In other words, Terrance has been doing custom woodworking, with an emphasis on Japanese architecture, for almost 40 years! Terrance’s task was to find more people who wanted shoji. He did the sales work for the shop and sold Shoji through the local Futon Companies. Several Shoji were built in those days. Terrance went on into Carpentry installing skylights, fences etc. Much later, he dreamed of a company devoted to only building Shoji but was way too busy constructing commercial and residential buildings and paying his dues. A sideline developed building cabinets for the various contractors he worked for. Licensed as a General Contractor in 1994, he built lot’s of wonderful things. Portland Shoji Screen was born out of his success as an independent contractor, following years of working for himself as well as in partnership with numerous other contractors and architects in Portland, Seattle and Bellingham, Washington. In the summer of 1997, Terrance scored the job of a lifetime — the remodel of a condo for Tom and Caroline Stoel of Stoel Rives LLP. In 1999, he was awarded the job of building all the major displays for Chown Hardware which has stores located on NW 16th Ave in Portland and also in Bellevue, Washington. The project lasted almost two years and portlandshojiscreen.com was launched in 1999 to accommodate the increased interest in Asian style Japanese architecture. (2016 update: those displays are still in use). Almost all of the jobs I take are custom woodworking, specifically in the Japanese architecture. Notable Shoji jobs include the home of sculptor Pasha Stinson in Westmoreland where the whole house design revolved around the Shoji, the offices of Dr. Paul Greenbaum in Portland, Oregon, Green Apple Dental, Shigezo, a Japanese restaurant here in Portland on 37th and Division, the offices of Portland lawyers; Kell Alterman and Runstein, a womens health clinic; West Portland Physical Therapy Clinic, and ten large Shoji for the Googleplex, Google’s global headquarters in Mountain View, California. Portlandshojiscreen has Shoji all over the World with many on the East Coast of the US, mostly in NYC, Boston area. There were jobs shipped to Canada, Costa Rica, and The United Kingdom. There are over 1100 Shoji personal made by Terrance out there. 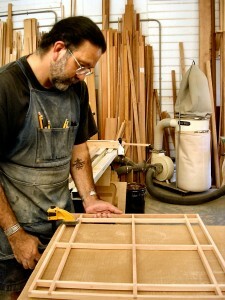 After occupying various spaces over the years, Portland Shoji Screen downsized to a workshop on North Portland Rd in 2007, where the business currently operates as a one-man enterprise. Downsizing has allowed Terrance to concentrate his talents on individual, custom woodworking (not all Japanese architecture woodworking) projects which has proven to be a great advantage for all his clients. No longer mired in doing massive amounts of quotes and drawings for customers all over the US and beyond, he is able to pursue Shoji making and woodworking as art. Outside of creating artisan woodwork and Shoji screens, Terrance invests many hours into getting his antique trucks and VWs to run. The current project is a 1986 Volkswagen Vanagon which was stored for 10 years. The 1937 Plymouth PU, a 1936 International PU and the 1922 Maxwell are now gone. Thanks to local mechanic and friends, Reid Brothers, who helped on many of my cars and trucks. RIP Reid. His other loves in life are his wife Nora, all his wonderful friends here in the US, Colombia, and Ecuador, Griffin the Great Pyrenees pup, and Gracie the cat. Terrance believes in animal rights and supports finding a cure for all cancers.